As one gets on a bit in years it is a comfort when customary things like the dental floss and shoes stay the same, but the sad fact is that most often they do not and it is necessary to find available replacements with a different fit and feel. So it seems to have been through geological time. Even a casual look at sediment sections in cuts along the side of the road reveals that nothing ever stays the same. Yet there seems a notion among people who embrace and foster new styles of floss and shoes, that our climate should stay the same. Not. 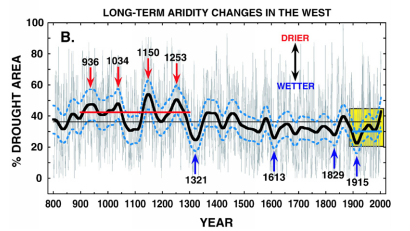 Because we are fortunate enough to live in an interglacial period of the current ice age, the Pleistocene, and human agriculture, civilization, and technology began to flourish after it had warmed up a bit, we seem to believe we are entitled to a stable climate. It has never been thus. Civilizations have been wiped off the map when they built sand castles on the assumption that climate would endure. 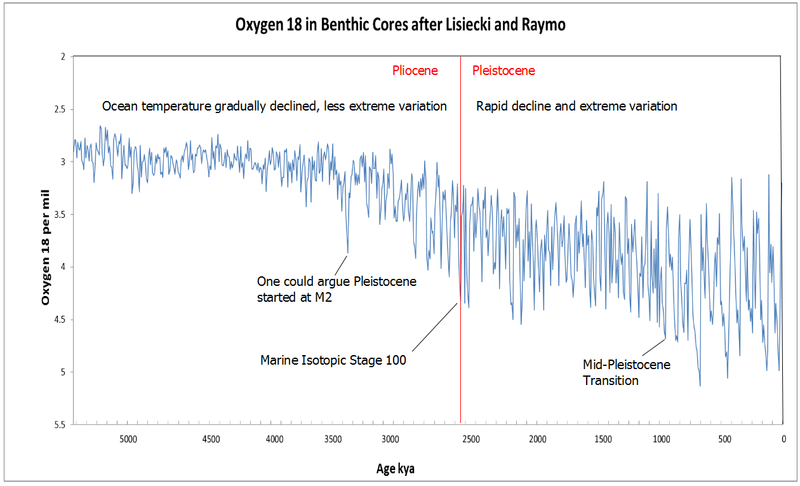 Far from the garden of Eden, this is what Oxygen isotopes in ocean cores tell us about the temperature of the Pleistocene. The genus Homo is believed to have evolved at the Pliocene/Pleistocene boundary. The real garden was before the janky Pleistocene when the climate was a bit warmer and far more stable. No wonder we naked apes are fraught with guilt and inclined to sacrifice when the fickle Edens of interglacial periods wane dry and cold. All this is time scale of millions of years. A human life is twenty to thirty thousand days. The “Hollowscene” is the name we have given the interglacial period we happen to live in as if it warranted classification with the Miocene, Pliocene, etc. We feel sooo special. For perspective there is evidence of agriculture in Asia about eleven thousand years ago, the first cities five thousand years ago, and the Persian first super empire and the foundations of world religions over a millennium centered about two thousand years ago. 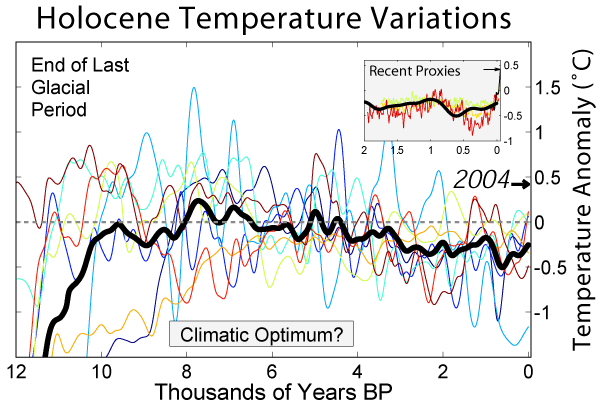 The graphic above is a nice piece of work from a while back that shows eight different proxies for temperature since the last glaciation and a stupid heavy “average” line. At first glance one might conclude that our proxies are completely out to lunch, out of phase, and unreliable. This is not the case. They record regional variations. The dark blue (hard to cipher at this lousy resolution) is a tropical Atlantic core. The rust color is a composite of Pacific cores and these two are the most logical segues from the worldwide composite of cores in the first graphic. The other proxies are Greenland, Kilimanjaro, and two Antarctic ice cores, a North Atlantic core, and European pollen. The take home message should be that the regional variations are so extreme and out of phase as to render the average meaningless in regard to living conditions. We can zoom in to a particular region, the western U.S, in this graphic from Cook et al 2007. The Anasazi founded Chaco Canyon, the hub of a cultural center and an impressive series of roads in about 900 and abandoned it in about 1130. Let’s zoom in further to something codgers alive today can remember. Everything here is back to global scale and the red temperature anomaly is the thermometer and satellite version of the average dark line panned as meaningless in the hollowscene. 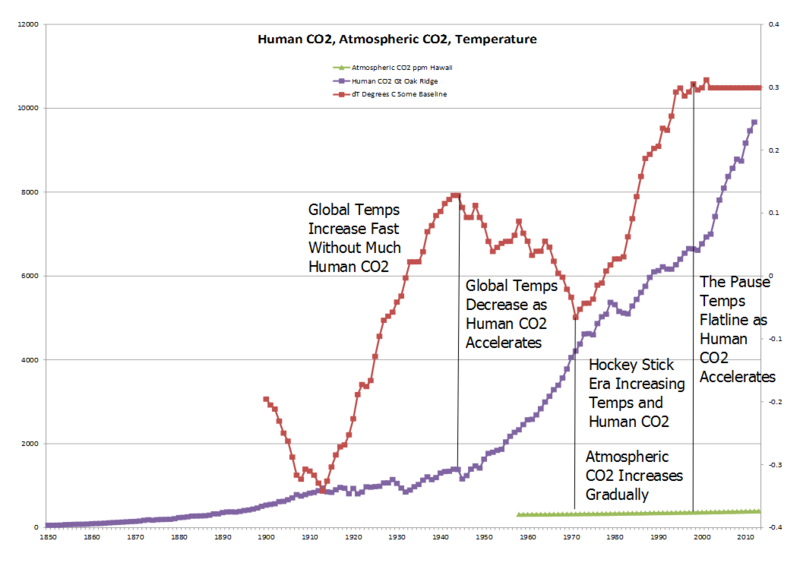 No actual place on earth experienced this time series as such and it is extracted from daily, seasonal, and regional variations that would render it absurd, but if we will compare temperature with other global observations, we have no choice. It should be clear that climate like evolution, language, civilization, culture, and political hegemony is not static on any time scale. Weather has always been crazy. We can no more hold on to some idealized climate than I can forever have my favorite dental floss. This entry was posted in Anthropology, Climate and tagged change, Climate Change. Bookmark the permalink.